What Can You Expect from This Private Mental Health Hospital For Minnesota Teens? As a top-rated private mental health hospital for Minnesota teens, we at ViewPoint Center believe that a proper diagnosis of our patients is a key to helping them get better. 3 out of 4 patients that come to us are misdiagnosed. With an inaccurate diagnosis, every treatment plan is bound to fail. That’s why we put together a team of experts from all the relevant fields of psychology and therapy to assess our patients from every possible angle. Such a comprehensive evaluation allows us to create a unique treatment plan for every single of our patients. It’s what makes our private mental health hospital for Minnesota teens stand out from all the others. Although we are located outside of Minnesota, we help teens from all over the country find success. 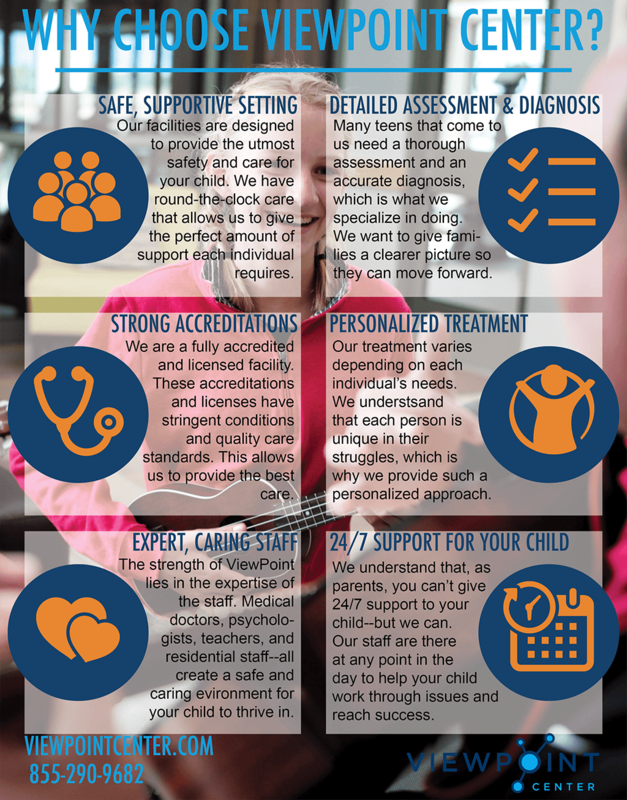 The physical and mental health of our patients are assessed and reassessed on a daily basis, starting from day one. With individual, group, and family therapy, we carefully examine their behavior in a different environment and with different people, which allows us to get to the core of the problem. As the weeks go by (usually 5-6), we get a full picture of every patient and are able to determine an effective treatment plan based on what we observed. Every teen in our private mental health hospital is given the necessary amount of attention, while our facilities are designed to provide a safe and relaxing environment, with enough time for recreation and free time, which further help us to evaluate our patients. ViewPoint Center is a private mental health hospital for Minnesota teens that has all the necessary experts in one place. We believe that a proper and extensive assessment can be conducted only when all the information gathered from doctors, therapists, and psychologists is gathered in one place and analyzed. 3 out of 4 patients that we admit have the wrong diagnosis and therefore cannot be properly treated. As a private mental health hospital with a top-notch staff, we are capable of establishing a proper diagnosis and a course of action to help our Minnesota patients. Although we are not located in Minnesota, we help teens and families from all over the country. We admit boys and girls, ages 12-18 for a period of 4-6 weeks and have a capacity of 26 beds. The capacity in our private mental health hospital is intentionally limited so that our staff can spend enough time with each child and that each child receives a proper attention. Teens with issues such as depression, anorexia or bulimia, suicidal tendencies and many other psychological issues, can all benefit from staying with us. We offer a safe environment and multiple types of therapy to successfully tackle any problem your child might have. To learn more about our private mental health hospital, call 855-290-9682 or fill out our contact form and we’ll get back to you in less than 24 hours. WebMD – One of the most reliable health portals on the Internet. They cover every single aspect of human health, including mental health and cooperate with numerous experts to offer 100% true information. They have numerous articles about mental disorders aimed at teens and their parents.